OpenLM version 2.0 supports license monitoring of a wide, and ever growing variety of license managers. This application note elaborates the steps required to configure OpenLM to interface the OpenText License Manager, and obtain reliable license reports and usage statistics. 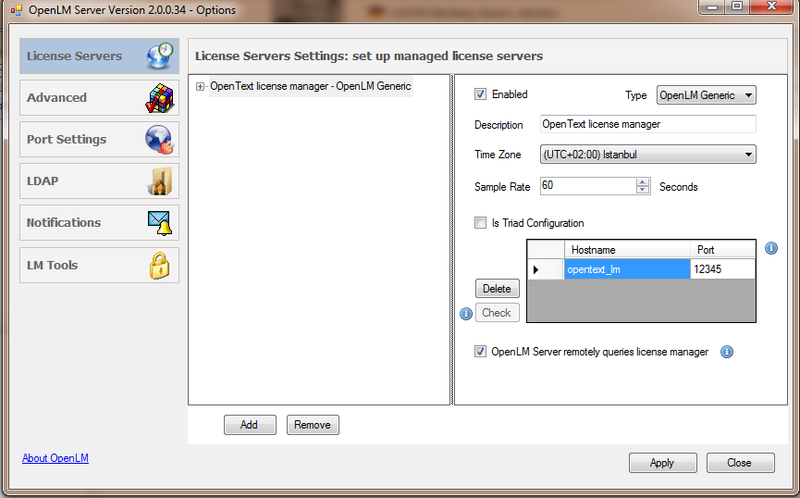 The OpenText license manager directs usage data into a log file. A lightweight Java application (EventLog_Monitor) is run on the OpenText license server. It detects changes made to the log file and produces an OpenLM generic XML file which holds this data. 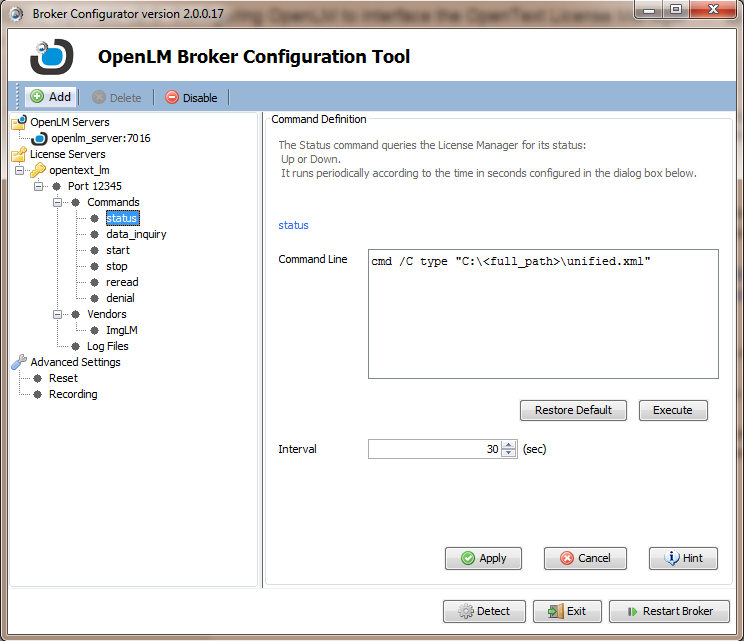 The OpenLM Broker propagates the XML file it to the OpenLM Server. The OpenLM Server parses this XML and presents it in the OpenLM EasyAdmin web application. 1. The OpenText license manager needs to be configured to log all information to a specific file (e.g. opentext.log). Make sure that the log size and rotation are adequate for containing the entire license usage information over a few minutes. 2. Download the EventLog_Monitor and copy the entire EventLog_Monitor folder to the OpenText server, preferably under the OpenLM Broker installation folder (see OpenLM Broker configuration, below). license.info = filename and path as specified in #3 above. sync.interval = number of seconds to update the xml file. Should be smaller than the interval specified in “data_inquiry” command on the OpenLM Broker configuration tool. Make sure to use ‘/’ instead of ‘\’ as a separator for full paths in this file. ‘0’ – Do not log this event. will cause an event of successful license check-out not to be logged. Event Log File Max Size: Maximal size of the log file in MB. Set it to be large (see note below). Event Log File Max Duration: Number of days for running the log. Set it for 365 days(see note below). When either Max Size or Max Duration limits are surpassed, a new log file will be commenced, and it will be named according to the commencement date (e.g. : ImgLM_01_17_14.log started at January 17, 2014). Since OpenLM is configured to monitor a specific log file – this will end the OpenLM monitoring. The user should head this issue. Click the LogMonitorService.exe icon in the EventLog_Monitor directory to start the “OpenLM Opentext event monitor” service. Make sure the services has been started. The unified XML file should consequently be created now. Set the OpenLM Broker port number (e.g. : maintained at its default value 7016). The license server hostname and port should be set exactly as they were defined in step #4 above (e.g. : OpenText, 12345). Do the same for the ‘status’ command. Clear the “OpenLM Server remotely queries license manager” box. Run the EventLog_Monitor.jar command. Note that at the time of writing these lines the EventLog_Monitor is not run as a service, but should remain running permanently. One option to bypass this obstacle is to use a 3rd party tool such as”alwaysUp” that would run it as a Windows service.